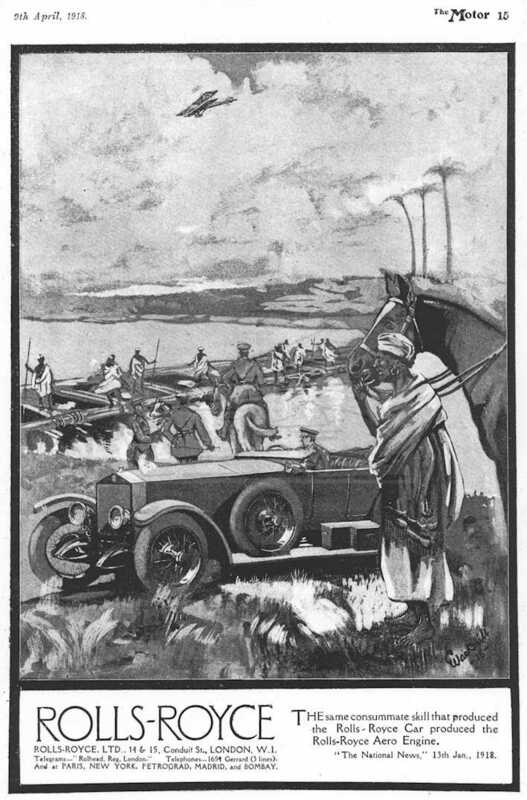 This company Rolls-Royce advertisement appears in The Motor magazine on the 9th April 1918. The signature is difficult to read but looks like Wackrill. Tom Clarke has done some research and it would appear that there was family of painters/art critics called Wackrill. Which individual completed this work has still to be resolved …………………………………………………………………………………………………………………………………………………………………………………………... The following information has been supplied by Peter Grenville a great nephew of the artist..-.I am only aware he was a graphic artist, but also produced some landscape oil paintings, of which I have a few. There is also a painting of an Esso oil tanker by him on the internet ( my grandfather was a director). George E Wackrill was born circa 1891, near Birmingham, married a lady surname Hughes in January 1912 and had a son who became a monk ! Divorced ? He lived in a flat not far from Fulham Broadway, on Fulham Road, in the latter part of his life, obtaining materials from the Windsor and Newton shop on Fulham road. He was a member of the Chelsea Arts Club up to the mid 1950's. He died in the quarter ended June 1960. The only other thing i remember is that he was bald, and very deaf ! I dont think he earned much income, and believe he was supported by his brother my grandfather, WF Wackrill ………………………………………………………………………………………………………………………………………………………………………………………………………….Tom Clarke was able to add some further biographical data - George Edward Wackrill b. Harborne, Staffs., 1890. Brother was Walter Frederick Wackrill. Father was a hairdresser working from home. m. Miss Agnes Mabel Hughes (1885-1967) 1912 in Aston, Warks. She died in Warks. Children: Anthony T. Wackrill b.Wandsworth 20 April 1913, d.1980? ; Margaret M. Wackrill b.Wandsworth 1917 d. in Redcliffe Gardens, Kensington 27 May 1960 and left a tiny sum to his brother only. No mention in will of wife or children. By 1911 boarding with the Youngs family, Clapham Common, as an artist but thereafter moved all over London. 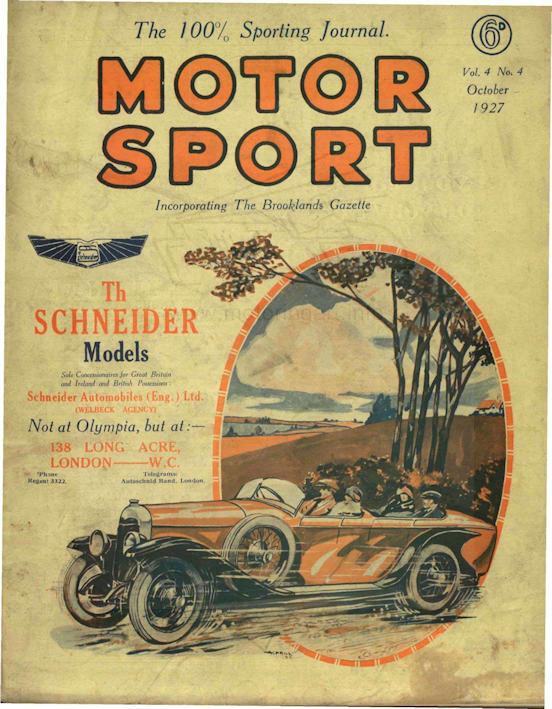 Motor Sport magazine cover art October 1927, Image courtesy of Stuart Middlemiss.